This hearty and healthy grain salad isn’t just pretty to look at, it’s pretty tasty, too! Sometimes leafy green salads just don’t cut it in the middle of winter, so that’s where this recipe comes to the rescue. Take it to work, or serve it as a side dish or light dinner. Note: This salad tastes best when allowed to chill for several hours in the refrigerator (or overnight) before serving. Preheat oven to 400 F. Toss squash cubes with 1 tbsp olive oil and a sprinkle of salt and pepper. Spread squash evenly on a small, foil-lined baking sheet. Roast for 20 to 30 minutes, depending on size of cubes. Give squash a stir halfway through cooking time. Squash should be tender but still have a slight bite. Squishy squash is not good! Remove from oven and let cool. 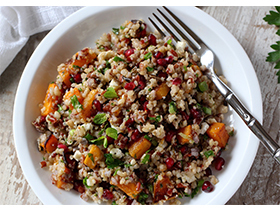 In a large bowl, combine cooked grains, squash, pomegranate, green onions, parsley, mint and feta. Stir gently to combine. Pretty! Now whisk together the remaining 2 tbsp olive oil, lemon juice, maple syrup, vinegar, mustard and orange zest (if using) in a small bowl. Pour over salad. Add some freshly ground black pepper and salt. A generous grinding of both. (Do you have a salt grinder? We love our salt grinders full of pink Himalayan sea salt.) Mix well, being careful not to squish the squash. Cover with plastic wrap and refrigerate for at least 4 hours. This step is important. Overnight chilling is even better. Serve cold. Makes about 8 cups salad. You can use just about any grain you prefer in this salad. We used a combination of quinoa with brown, red and wild rice. It was a pre-mixed blend and you’ll find many of those at the store. You can use red and white quinoa, wheat berries, farro, couscous, bulgur, whatever! Just make sure you use 4 cups (or so) of the COOKED grain in this recipe and let it cool after cooking. We used 1.5 cups of dry grain to get just over 4 cups cooked grain. But it really depends on which grain you’re cooking! For added flavor, you can cook the grain in vegetable or chicken broth instead of water. A 2-lb (908 g) butternut squash should be plenty for this recipe. If you’re not a fan of pomegranate, use dried cranberries. Finally, this salad works equally well with sweet potatoes instead of squash.